Just love this flower. I've just gotten into the embossing folders and just love them. 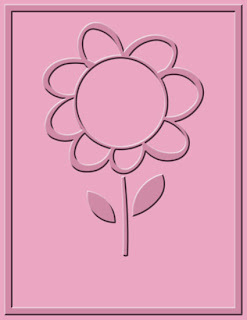 Such a cute embossing folder! Thanks for the chance to win it!! This is adorable. Ihaven't seen this one yet which means none of my stampin/scrapin friends have it. Thanks for the chance. Hope you had fun at CHA. Thanks for offering the RAK. I love my Cuttlebug! I would love to win this. I, also would like to know if you ship to Canada and, if so, how much would it be for the embossing folders? wow I love you leaf things those are so neat. Hope you had a great time at CHA! Your blog is different from the others that I have subscribed to or visited. I like it! The pictures of your flowers and the recipes. Very nice, indeed! Oh wow, what a great cuttlebug folder! Wow, I've never seen this one before. Great blog! I hope you enjoyed the CHA show. I love this flower.. thanks for the chance to win it. I love your scrapbook page about getting your 1st TV & remenising about all those fun old programs. Wasn't it a thrill when we got those first color TV's too:) Thanks for the chance at a Cuttlebug folder. I have seen this before, then when I decided to buy it, they were gone. Thanks so much for sharing. I got my cuttlebug for my birthday and just love it.